A Vanderbilt University senior is being honored with what's considered the Nobel Prize for child advocates. It's called the World of Children Award, and 20-year-old Dallas Jessup is one of six recipients. "It was pretty shocking, I mean, it's quite an honor to be a part of this amazing group of people who are making an impact on our future," said Jessup. She's an author, filmmaker, and youth advocate who at just 15 years old, realized she had a valuable skill that was worth sharing with the rest of the world. Jessup has had a black belt in martial arts since she was 10. In high school, she heard a story on the news about a young girl who'd been abducted and killed in Florida. Her idea, at first, was to teach the girls at her school some self-defense techniques, so they could protect themselves if faced with a similar situation. "The more aware you are, the less likely you are to become a victim," she said. From that idea, came a film called "Just Yell Fire", that was released on the Internet and spread like wildfire, all over the world. "Now over 1.8 million people have seen it in 64 countries," Jessup said. She now runs a non-profit, also called "Just Yell Fire", and has been featured on dozens of national news programs. "People are really excited about it and it makes me feel happy knowing that what I'm doing is making a difference, and people approve of it and enjoy it," she said. Since the first film, Jessup has produced a second one geared toward college students. "I mean, especially on college campuses, 9 out of 20 rapes aren't reported, and so it's a much bigger epidemic than we can even imagine," she said." She says statistics like that keep her going. 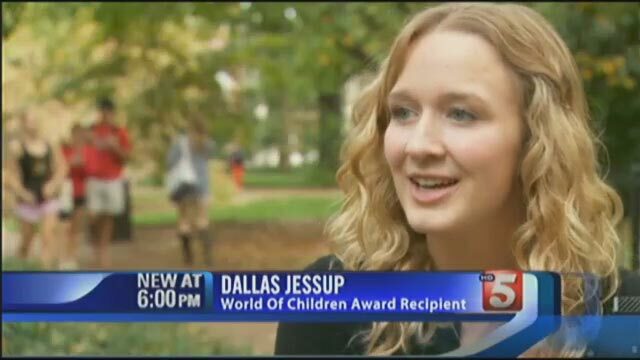 Jessup Dallas will travel to New York next month to accept the World of Children Award and the $75,000 grant that comes with it, which will be used to help fund her non-profit organization. To learn more, or to view her self-defense films, click here: http://www.justyellfire.com.